It is the opening ceremony of the Winter Olympics is Sochi. And what makes any athletic event better? Booze, of course. The challenge is selecting a drink to pair with the Olympics. My first thought was "What would the Dude drink?" Five parts vodka and two parts coffee liqueur over ice with three parts cream floated on top. A good call, right? But then my next thought was "What would Nick Floyd drink?" The first answer was the blood of a woodland creature that was sacrificed on an alter dedicated to the great satan himself. But the second answer was very similar: Dark Lord Russian Impreial Stout. So I'm sitting in front of the TV, watching the opening ceremonies in Russia. The Dude standing on one shoulder, offering a White Russian while Nick Floyd is standing on the other shoulder, offering Dark Lord. What did I do? Combine them, of course. Meet the Dark Russian Lord. 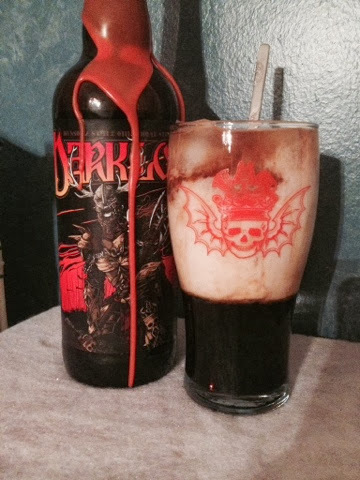 Five parts Three Floyds Dark Lord and two parts vodka on ice with three parts cream floated on top. When stirred to combine, it looks like an iced coffee and cream. The nose is similar to Dark Lord with pronounced coffee aromas. The mouthfeel is light and creamy. The flavor is a tamed version of Dark Lord crossed with a milkshake. Overall, an enjoyable option that abides. It's not quite as good my Dark Lord Eggnog (replace the dark liquor in an egg nog recipe with Dark Lord...easy), but a great beverage to Putin your mouth, comrade.